India is a multilingual nation with many languages and mother tongues, both classified and unclassified. The census of 2001, claims there to be 122 languages and 234 mother tongues in India. It is interesting to note that the number of languages and mother tongues have varied from census to census. For instance the 1991 census claimed 114 languages and 216 mother tongues. Then there are languages with less than 10,000 speakers that don’t even picture in the census. So, in a nation with so many mother tongues (including languages), language planning becomes an important issue. The reorganisation of the states in India happened on the linguistic basis. Currently India has 22 scheduled languages and no national language. Official language of India is Hindi in Devanagari script, with English as an additional language for official work. All other Scheduled languages are official languages as well. This being said, the state boundaries not only have official language of the state but so many other languages that co-exist. In such a complex multilingual scenario, many languages adopt the contiguous powerful language in the more social spaces while still continuing to speak their mother tongue in home spaces, while many actually shun their mother tongue to speak a more “powerful language”. These languages again may not be one of the scheduled languages, but maybe just more powerful than many mother tongues. Language is important as a social reality for a group and also as an identity marker. The diversity of cultures, languages and identities must co-exist and not try to merge the smaller cultures into the more dominant ones. Language plays an important role, not only as an identity marker but also in the sphere of education. In a country where certain tribal and minority languages are on the brink of extinction and some are fighting a battle to survive, here is the case of Tripuri/Kokborok, a language which, with the help of the government of a state is actually flourishing and growing. Very briefly, let us talk about the language Kokborokalso known as Kokborok or Borok language. The language is primarily that of the tribal people of Tripura. It is also known as Tripuri language. Apart from Tripura the language is also spoken in the neighbouring regions in Bangladesh. The language belongs to Tibeto-Burman language family, which comes under the Sino-Tibetan language group.Other important tribal languages in Tripura are Chakma, Halamkuki, Mog, Bishnupriya Manipuri and Manipuri languages. Language policies have been an important factor for determining the future of a language and there have been various alternative experiments done over time, across the world. The case of India is not very easily compared to any other nation, due to the diversity in languages and existence of many language families within one nation boundary. However we would be comparing some alternate language policies actually being implemented by a state within our diverse country, with those of the first phase of language policies adopted by USSR. Small nationalities without scripts were to conduct all education and create all literature in the language of the federation. Small and medium-sized monolingual nationalities without scripts were to create primary schools, educational literature and mass political propaganda in the native language. Secondary schools, middle professional education and higher education will be conducted in the ‘language of the federation’. Medium or large-sized monolingual nationalities were to create primary, secondary and middle professional education, together with political-educational literature and other scholarly and educational literature, in the native language. The ‘language of the federation’ will be introduced no later than the third grade and to continue into higher education. Economically and culturally developed nationalities that have traditional scripts and are territorially united, they were to create all education from primary schools to universities, and all literature (including technical texts), in the native language. The ‘language of the federation’ will be introduced no later than the third grade. As Grenoble (2003:45) observes, “Putting aside the issue of the development of the native languages, the rapid increase in literacy is one of the primary achievements of the early Soviet years. Literacy jumped from an overall average of only 24 percent for Tsarist Russia(1897) to a remarkable 81.2 percent for the USSR in 1939, a gain achieved in just over forty years. The gains in the countryside were even more impressive, with a dramatic leap from 19.6 percent in 1897 to 76.7 percent in 1939.” Though 1938 onwards, there was a further shift in the language policies of USSR, and its main thrust was on universalising the knowledge of Russian language(the second phase), in the first phase emphasis was to develop the minority languages. This led to the rapid growth of literacy in Russia. The second phase was of Russian hegemony through glorification, which was not such a successful phase and resulted in the loss of indigenous languages by the time of the breakdown of USSR. It shall be the endeavor of every State and of every local authority within the State to provide adequate facilities for instruction in the mother-tongue at the primary stage of education to children belonging to linguistic minority groups and the President may issue such directions to any State as he considers necessary or proper for securing the provision of such facilities. Article 350(B) provides for a special officer for Linguistic Minorities. There shall be a Special Officer for linguistic minorities to be appointed by the President. It shall be the duty of the Special Officer to investigate all matters relating to the safeguards provided for linguistic minorities under the Constitution and report to the President upon those matters at such intervals as the President may direct, and the President shall cause all such reports to be laid before each House of Parliament, and sent to the Government of the States concerned. Despite these safeguards, UNESCO (2009) identified 196 Indian languages as endangered. However, existence of these policies cannot ensure safeguard mechanisms only because the provisions exist in the Constitution. Additional efforts have to be constantly made to ensure success. India is one of the most linguistically diverse nations of the world and therefore it is perhaps not easy to solve all the language problems of the country. Nonetheless there are some experiments which are proving to be helpful in not only promoting and developing a language but also in improving the literacy rate among the tribals and therefore in overall population as well. In the case of Tripuri, while Tripura had only Bengali as their official language till 1979,Kokborok was recognised as an important tribal language and was given the official language status in that year soon after the left front government came to power in the state. Very soon after that, the government established a “Kok-Borok Advisory Board” for the development of the language. A Tribal language cell was also put up under the Education Department. In 1981, Kokborok was introduced as a medium of instruction in 1200 primary schools. Kokborok was also introduced at higher education level. Despite these initiatives, due to lack of teachers etc, initially the growth of the language was slightly slow, but in the past 20-25 years, the language Kokborok has been revived at great speed due to these initiatives by the government and the participation of the people of the state. This has led to higher percentage of tribal children getting education and also gaining an overall language pride. Some social organisations are also taking part in the government initiatives to promote the language. Some literary magazines have been launched in the language for promoting the language. According to the census of India, the number of speakers of Kokborak in the state were 6,46,196 in 1991, which significantly went up to 8,14,375 speakers in 2001. In order to promote and develop other tribal languages in the state after the success of Kokborok experiment, committees have been set up by School Education Department, Govt. of Tripura for all the other important Tribal languages and Bishnupriya Manipuri Language is taught as a subject in as many as 36 schools, and Manipuri is taught in 21 schools in Tripura from classes I to V. According to the website of the School Education Department, Government of Tripura, text books from classes I to IV have been prepared and ready for publication in Chakma and HalamKuki Language. 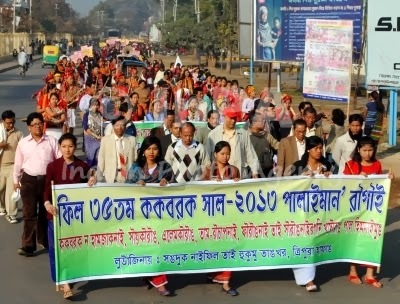 The increase in literacy rate in Tripura is a result of various factors. Government spending on education/ education infrastructure, political and administrative initiatives like ‘VidyalayaCholoAbhiyan – 2009’ taken by the government, people’s will and initiatives have been some of the reasons in this impressive increase. Among the policy initiatives taken by the government one cannot ignore the importance given to promote education in the tribal languages to ensure the participation and presence of tribal children in the primary schools.Language forms an important part of one’s social identity, and government policies can play an important role in not only ensuring growth of the language, but the community as a whole. That some states promote and aid in enriching their languages, is in itself a heartening sign and can be emulated in other parts of the country.